SKYTEK™, Martab’s unique RFID Asset Management solution, helps healthcare providers be more efficient, improve safety and clinical staff satisfaction as well as reduce costs. Asset Management and Inventory Control Solutions allow healthcare providers to be more efficient by automating operations and clinical support functions such as materials, equipment distribution, facilities and maintenance, medical supplies and linen services. By utilizing Martab’s unique RFID technology combined with our proprietary mobile applications and data analytics, healthcare providers can improve asset utilization, increase staff efficiency, optimize workflow and eliminate delays in care delivery. Fill out the form below to sign up or to get more information. Martab has developed a proprietary passive RFID Tag technology designed specifically for movable medical equipment. 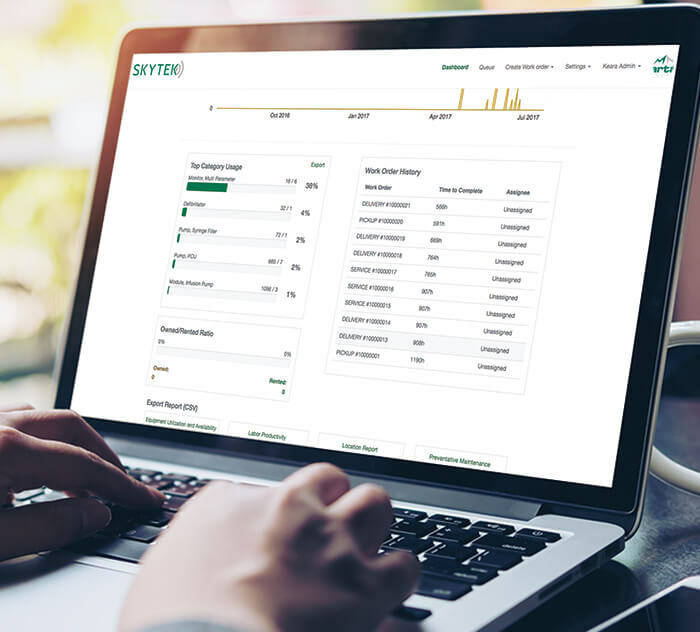 Utilize SKYTEK’s Dash Board and advanced Reporting to track equipment orders, measure the improvement in equipment utilization and view the PM status of your equipment in use. Our cloud based system means your connected anywhere, on any device, anytime. Our mobile and web applications allows users to access current data from any smart phone, tablet or PC. Please fill out the form below and we will contact you to begin the sign up process.